From terracotta storage jars to the world’s ‘lightest timber table’, London-based industrial designer Benjamin Hubert showcases his commitment to sustainable design in the most interesting of ways. 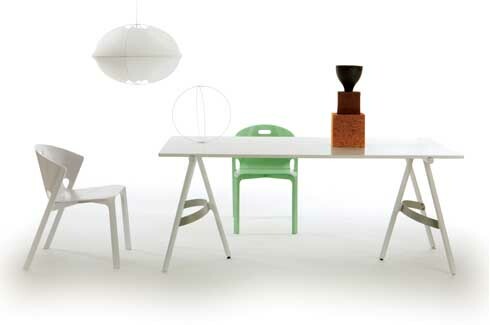 This is evident in Hubert’s award-winning designs for furniture, lighting, interiors and various objects for the home. The studio has a strong focus on sustainability and incorporates it into each project. This attention to creating durable objects has resulted in some very innovative and interesting products. Take his range of furniture, for example. Hubert’s earliest products were made of metal and granite (Gabion, Silo, Pebble). He has since moved to using recyclable and indigenous materials that are simple to manufacture and assemble. 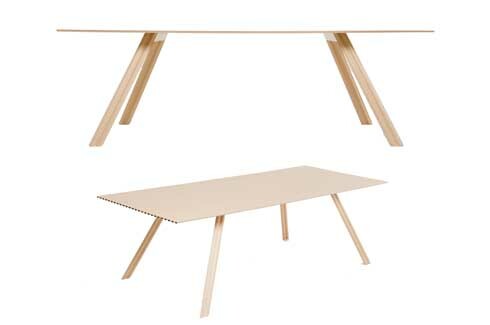 The Bow series of furniture (for Portuguese manufacturer De La Espada) uses a “system of simple timber frames and surfaces held in tension by a rolled sheet of mild steel.” This timber and steel combination (which took a year to research and develop), reduces shipping costs and has a low carbon footprint. The ‘Pelt’ dining chair is made of plywood and solid ash (like “the skin over an animal’s skeleton”) and can be stacked to up to six chairs high. The ‘Pelt’ family now includes two bar stools, a low stool and shelves available in a range of vibrant colours. 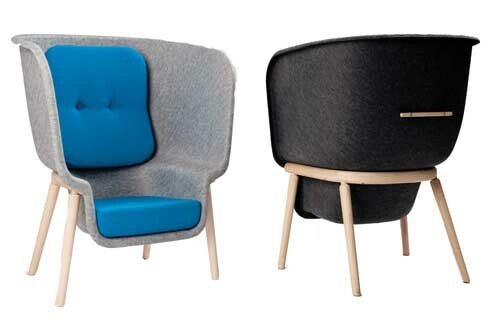 Hubert’s innovation brilliantly shows up in the ‘Membrane’ chair for German brand Classicon. 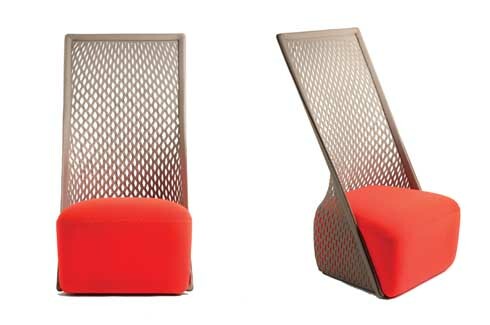 The chair has a stainless steel and aluminium frame which is covered in a 3D-woven mesh fabric and, surprise, weighs only 3.5 kg. By skipping the traditional polyurethane foam seat, a lower carbon footprint is once again established. 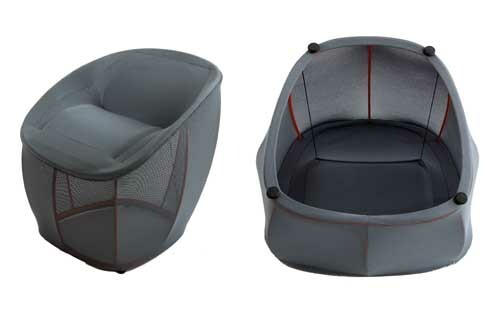 The innovation continues with the Pod chair designed for use in offices and other public spaces and nicknamed the ‘privacy chair’ thanks to its large shell which cocoons the user, providing an escape from the bustle around. 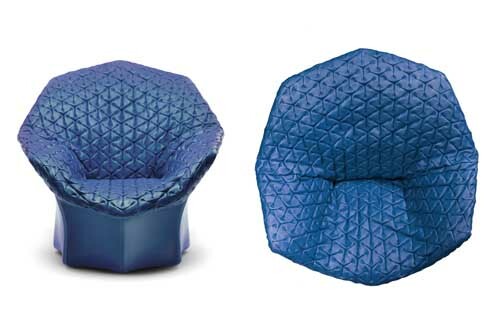 The shell of the Pod chair is one of the largest forms ever produced that uses pressed PET bottles to create felt. This curious material not only looks good but also offers sound-dampening properties. Use it in your home for a quiet moment or two! That, incidentally, was the theme of a competition to celebrate 100 years of the Italian brand Poltrona Frau. Twelve designers were invited to participate and Hubert’s Juliet walked away with the top prize. Interestingly, the inspiration for the armchair comes from the ‘Juliet’ sleeve popular in the Renaissance period – a sleeve which fits the arm tightly and has a large ‘puff’ on the shoulder. 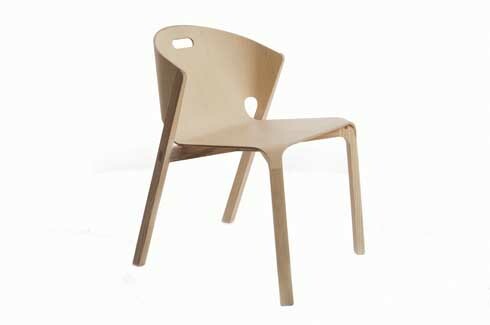 One of my favourite Hubert creations is the Cradle chair for Moroso. Marrying the traditional hammock with a conventional lounge chair, the Cradle is an invitation to relax. Contrarily, the design is also formal enough to fit right into your living room. A recent addition to the long list of interesting furniture from the studio is the ‘Ripple table’, the ‘world’s lightest timber table’ weighing just 9 kilograms. Created by using 70-80% less timber than a standard timber table, Ripple claims to be 400% more sustainable than solid timber products. 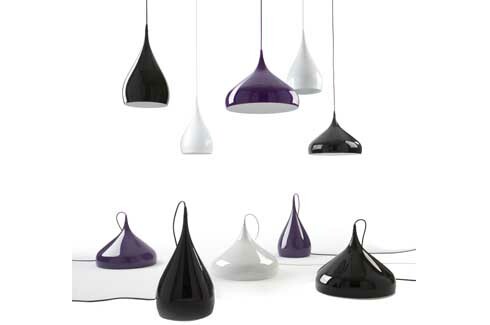 Hubert’s range of lighting also hits the sustainability target with consummate ease. 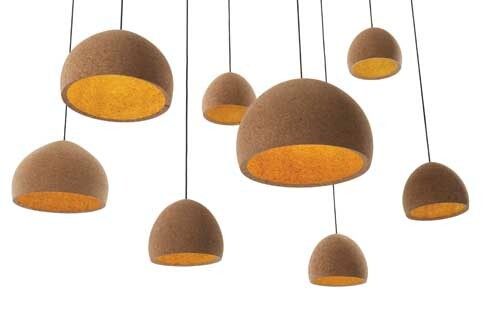 The ‘Float’ pendant lamp is made entirely from sustainable cork. Blocks of Portuguese cork are hollowed into a shade using traditional wood working techniques. Critics of this process say that a high volume of waste is generated but Hubert’s studio reuses the leftover dust into creating other blocks of cork for more lamps. 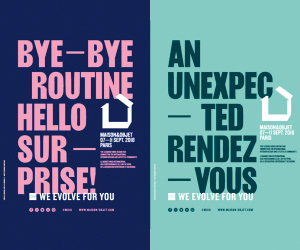 Apart from his focus on sustainability, Hubert also uses new and exciting materials for his products. The Loom lamps, resembling traditional Chinese lanterns, have shades made from a material normally used for bedding. ‘Spinning’ the pendant lamp series have aluminium pendants lathe-spun to give them that sense of movement inspired by children’s spinning tops. 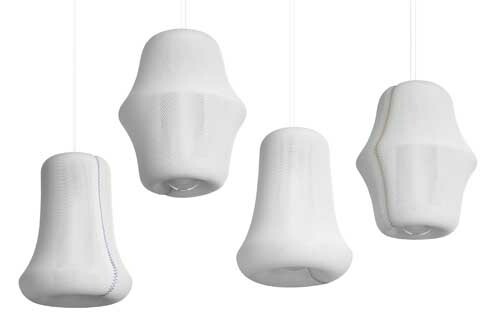 The sensual ‘Tenda Lamps’ on the other hand use fibreglass rods and stretchy Lycra used in the underwear industry. 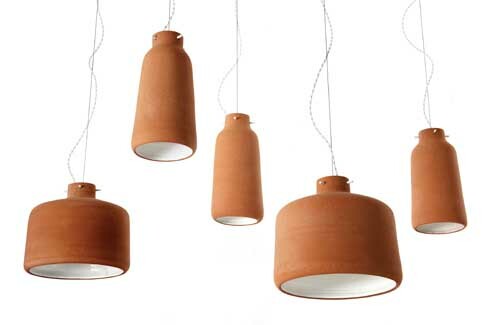 And lovers of terracotta will rejoice at the Chimney lights, a range of hand-thrown, kiln fired clay pendant lamps, each with its own individual character. Terracotta also shows up in Hubert’s ‘Pots’ – multi-purpose terracotta jars for serving and storing. Use them to store anything from spaghetti to biscuits. The ‘Pots’ come with their own lids making storage simple yet pleasing to the eye. 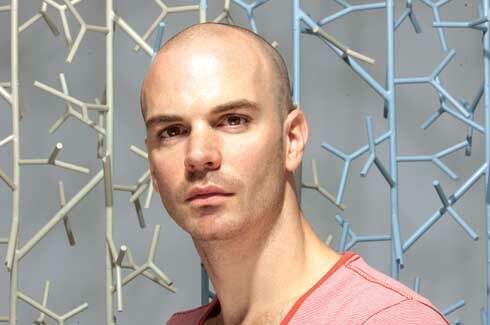 Thanks to Benjamin Hubert and designers who share his sensibilities, we can now make a conscious choice to live better. Send those PET bottles to the recycler. Better felt than garbage.